A money clip is compact and flat, fitting easily into a jacket or pants pocket without creating bulk! This polished silvertone money clip is an affordable and elegant way to keep your money organized and secure, with a hinged grip that holds up to 20 folded bills with ease. 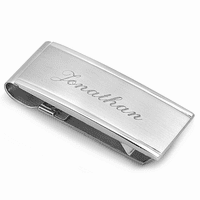 Add a unique and thoughtful touch with his initials or name engraved on the top, provided free of charge, along with a jewelry gift box for presentation. He will love carrying your gift wherever he goes! Want to Have Uncle John engraved on it can it be done ? Can it be engraved with 2 lines? Yes, just let us know in the comments section of our checkout page that you would like the engraving done on two lines and that you would like Uncle on line 1 and John on line 2. Hello. 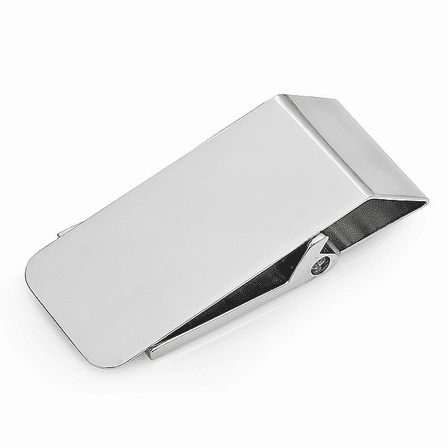 I am interested in buying the "Polished Silver Hinged Money Clip". Will this clip be able to hold my debit card? or is this product strictly for cash? Thank you. You can definitely hold a debit card too. It will hold best if you have some cash in there with the debit card but either way, it will clamp down on a debit card. 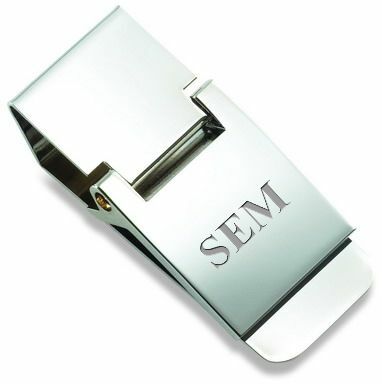 Can the following engraving be done on the back of the clip: Prof. Bideshi? 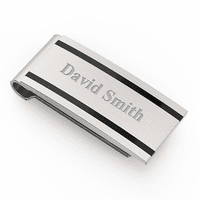 Sure, just let us know in the comments section of our checkout page that you would prefer the engraving on the back of the money clip. 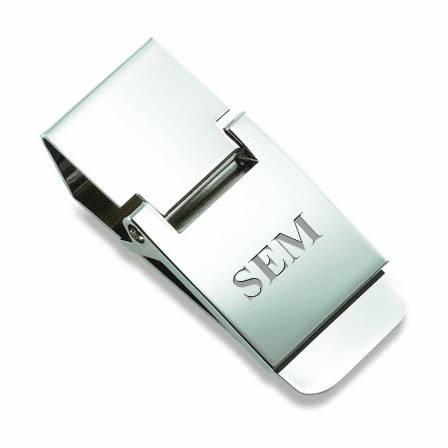 Can I send in a 3 letter logo in for engraving on a money clip? We can engrave a logo but there would be a 15 piece minimum. If you need fewer than 15 pieces, we could do standard letter engraving, free of charge, in the fonts shown on this page. Husband likes the money clip very much and the engraving was perfect. Ordered for my boyfriend for Valentine's day, he loved it. Engraving was exactly what I wanted looked really nice. Would recommend it. It's nice and the engraving was done as requested and shipped fast. I have used this type of money clip for the last 15 years. My old one finally broke and this was a perfect replacement. I also bought one for my son as a Christmas gift. Selecting items to view was very easy as was making the purchase. Having a different view for some of the merchandise could be helpful. The money clip was received timely considering possibly delay for a tropical storm. 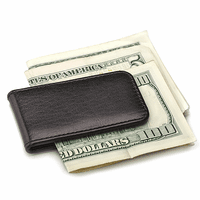 The money clip works as stated; can hold one bill or more. Fits well in pocket - not noticing everyone when money clip is in pocket of dress slacks. I love the hinge feature on this money clip, I can't find it anywhere anymore and this is exactly what I wanted. Ordered three clips for Christmas, one for me to that were given as gifts. After they arrived on time even during Christmas rush I found that it was hard to choose the ones to give away. Great selection. For the price, this product is well worth it. It is not flimsy and works very well. Engraving is perfect! The service is exceptional - stayed in touch during the complete process and notifications were timely. From beginning to end, it was prompt, clear and concise. Highly recommended. Merchant Response:We're so sorry, your order was received by us with no engraving instructions. You are welcome to mail this back to us and we'll engrave and ship it back out to you free of charge. Email us at help@executivegiftshoppe.com if you'd like to do this. this moneyclip replaced the one i had for 12 years,and its exactly the same.very glad that i find it,again.although the shiping cost for greece is too high. I bought this money clip as a gift and had it engraved. Very happy with my purchase and the shipping was quick too! I think the clip itself is attractive. However, I ordered it in silver tone and received the gold tone version. I had it personally engraved and now have to return it. I also found that it did not allow for a large amount of bills and credit cards combined. I think it is a good product if you only have bills to carry. Best money clip I have ever owned. Wish it was available in a brushed silver. I bought this money clip, as my old one was the traditional style which did not accommodate larger numbers of bills. The hinged mechanism on this clip allows the clip to accommodate a wide variation in numbers of bills. I would highly recommend your product... good quality. I wished the monogram was larger that is my only negative.